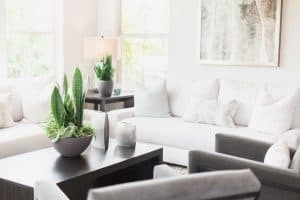 You are here: Home / blog / Ducks VS Chickens – What are the differences? Ducks VS Chickens – What are the differences? 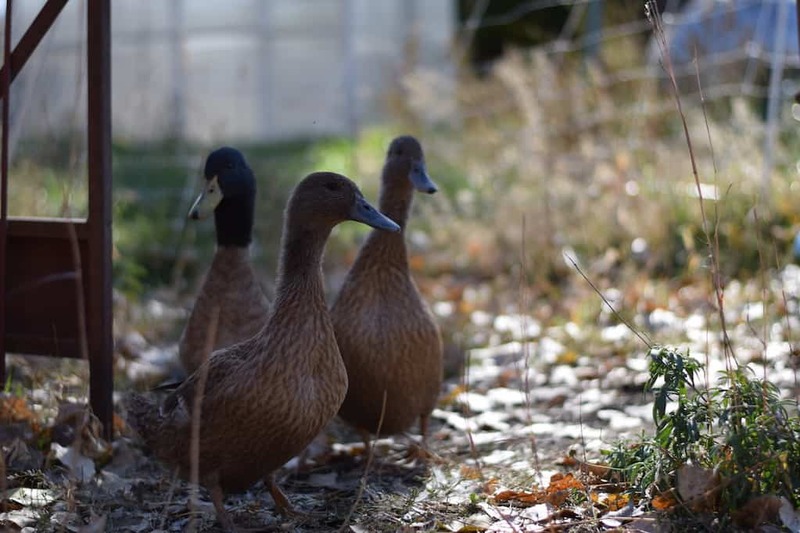 Often times when setting up a homestead, most people think of adding chickens to their backyard, but what about ducks? 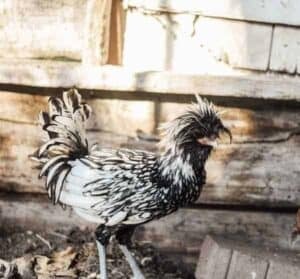 What are the main differences of raising Ducks VS Chickens? Ducks VS Chicks…what is the best option? At least this has been the case for our family. And it can have some major variations. Starting with raising them young. Here’s some tips for raising friendly ducks. Most of our chickens are gentle and friendly which makes them great for our toddlers to be around. And specific breeds are much more kinder than others. Our ducks are a little bit more friendly and are just less aggressive than chickens. And despite if your chickens mean to or not, it hurts when they peck you with their beaks. Add in a protective rooster to the mix and it could be a bad time, especially for little children. Domestic ducks also don’t fly which makes them easier for little ones to help catch when needed. But this is also another reason why I don’t like our ducks to free range. They can’t fly to safety if a predator is trying to get after them. One of our duck eggs on the left and one of our chicken eggs on the right. Some duck breeds are better layers than some chicken breeds. 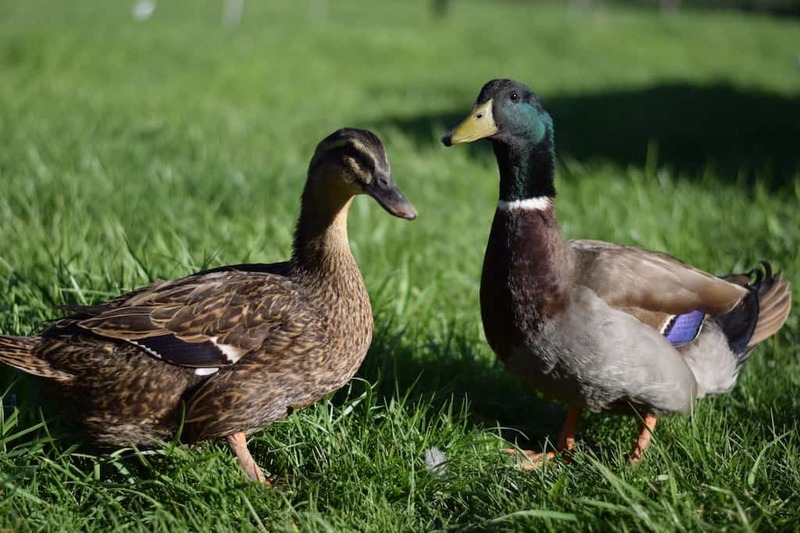 This can vary greatly on duck breed, which is also the same for chickens. 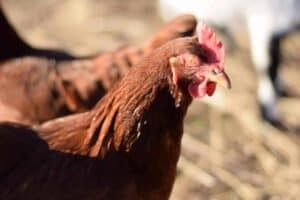 Some breeds lay year round which is great if you want to have fresh eggs daily and they lay more years than a chicken. Again, this can be dependent on breed. 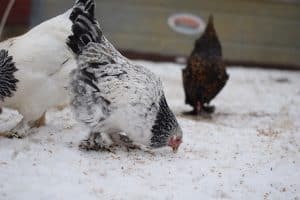 Chickens can also lay eggs year round, but most of the time it is done seasonally and slows down after a couple of years. Duck eggs have a higher fat content. But good fat is, well good. 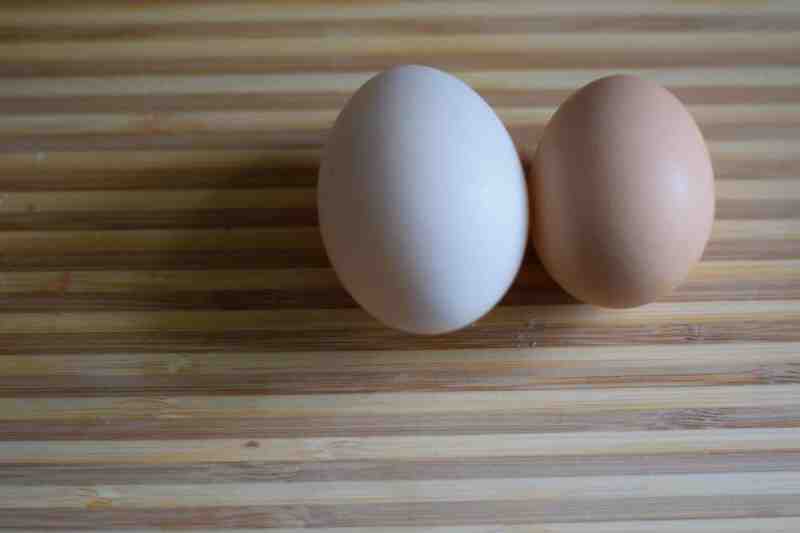 Their eggs are also generally bigger and contain more egg white which makes them great for baking. Some people say that they also have a richer taste. So it’s a matter of preference. And to be honest, we haven’t really noticed any difference. We house our ducks and chickens together. Originally we had them separated, but over the winter we moved the ducks to the chicken coop for added warmth. And they all instantly became buddies, so we decided not to separate them again. The ducks sleep on hay on the floor of the coop at night and the chickens sleep up on their perches. Ducks love and they need water readily available. Ducks love to swim and splash around in, but they also need water to swallow their food. But be warned, ducks are messy. Very, very messy. We personally don’t keep water in the coop because we don’t want a disaster or added moisture to make our flock sick. Note: get familiar with potential for diseases if keeping multi flocks housed together. A simple wading pool set up in the run with a few inches of water is sufficient for ducks. And because we don’t add too much water, it isn’t a problem if a chicken gets in the pool. We haven’t had much trouble with this. If you choose not to keep chickens and ducks together, a simple shelter that is protected from predators is all they need for night time. They also do not need a perch like chickens do. And if you do, consider there can be added risk of diseases. Some diseases effect each animal differently. Just be sure to do your research before making the decision on keeping multiple animals housed together. What do you feed ducks and chickens? Both ducks and chickens are excellent foragers. They love to graze around the yard and hunt for bugs and various plants. Since, we have a predator problem, we allow our flock to graze with our goats and use this electric fencing. 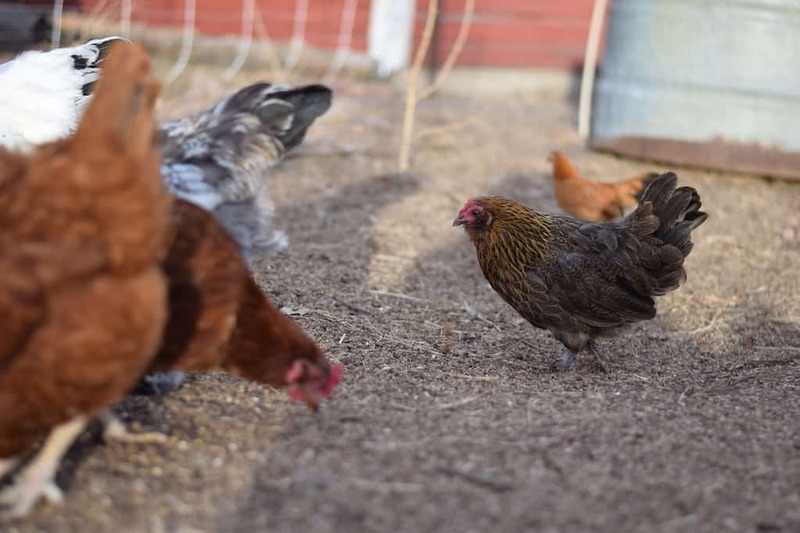 A word of warning, unless you plan on having chickens in your garden to help prep your garden beds, you probably don’t want them in your garden beds. They are great at scratching and tilling up the dirt and will pretty much destroy your garden. Ducks aren’t as destructive though. Ducks and chickens eat similar food, but ducks require a little more protein. We basically feed our chickens and ducks the same feed but it is used mostly as a supplement since they get most of their diet from foraging. We usually vary the supplements between layer feed, scratch grains, and cracked corn. And again, ducks need water to swallow and digest their feed. One difference between ducks and chickens is that ducks tend to eat a lot more. Both of our ducks and chickens get treats or kitchen scraps, leftover scrambled eggs, meal worms, etc. Contrary to what the majority of people think, feeding ducks bread or crackers is not beneficial to their health and should be avoided. Aside from the benefit of fresh eggs, bug and pest control, both ducks and chickens have some very awesome benefits. Have you every stepped out the door with treats and watched the chickens run across the yard to happily greet you at the fence? Pure entertainment. Ducks have a pretty awesome waddle. Just watching them walk across the yard and gobble up bugs, is enough to keep me entertained for awhile. I’m easily amused, folks. Both ducks and chickens are great animals for children. 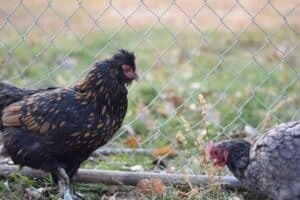 If you have toddlers and preschool age children, these animals make great starter animals to the homestead. Supervised, of course. 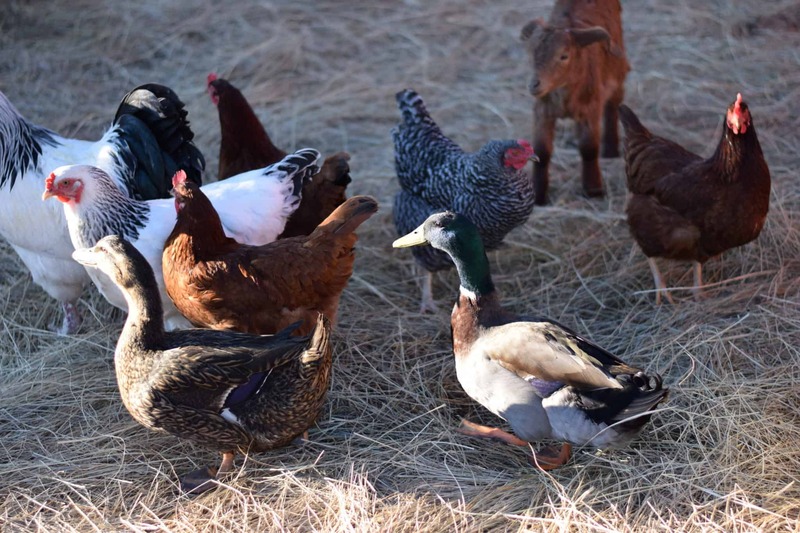 Teaching children duck and chicken chores is incredibly simple. My children get a ton of joy with helping collect eggs in their little baskets! 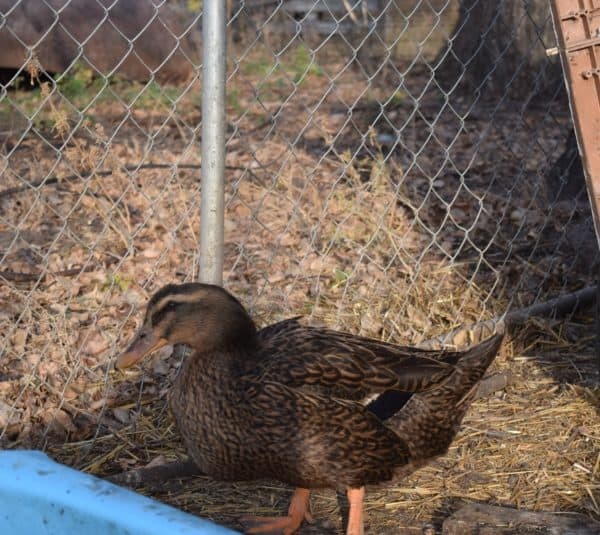 Aside from changing out their waterers, the wading pool, and feed bowls, both ducks and chickens are fairly low maintenance. So, those are just a little comparison of ducks vs chickens. 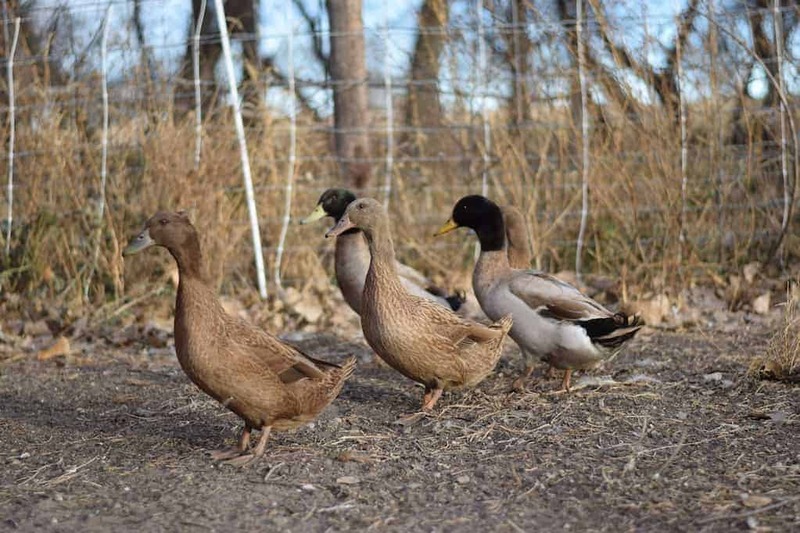 And why you should consider adding ducks to your homestead, because they clearly are the winner here. Ha. Yay! I love both chickens and ducks…and turkeys! This is our first year with ducks, and we keep them with our chickens too. Do you know when we can expect them to start laying? About how many months old? From what I remember, our ducks were around 4 months old when they started laying. I think it also depends on breed. What breed are you getting?